Construction is underway on the Vermont Studio Center's (VSC) Church Studios building. 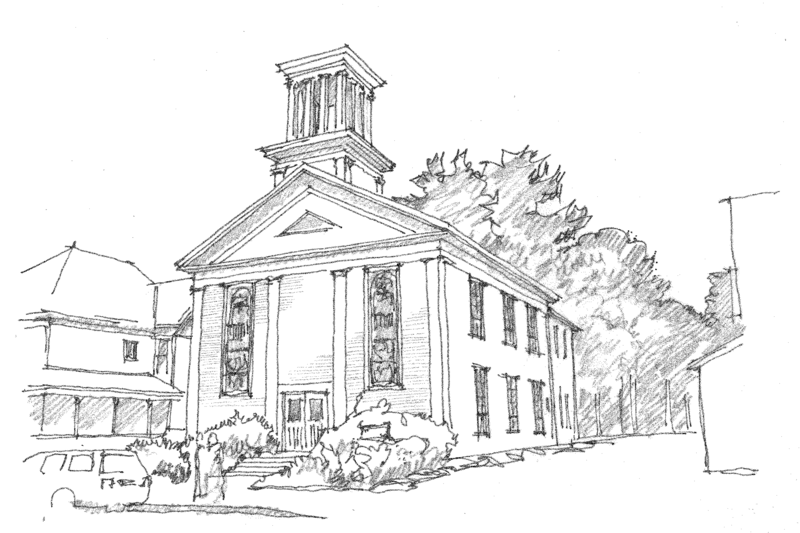 Located on Main Street in Johnson, Vermont's historic downtown on the Gihon River, the Church Studios project is the second to begin under the VSC Campus Master Plan developed by Cushman Design Group and VSC. CDG leads the master planning and design teams, with Jeff Schoelkopf and Jim Edgcomb of The Design Group of Warren, VT being architect of record. 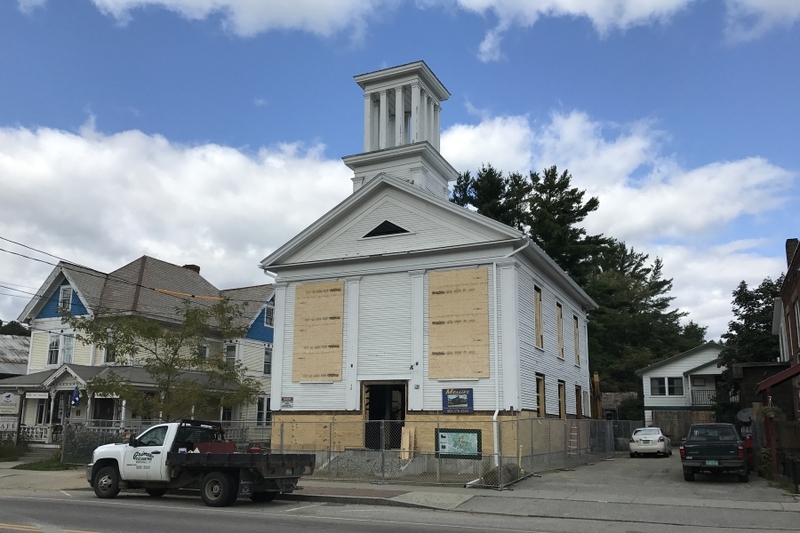 Travis Cutler and Tom Bjerke, Vice-President and Project Manager respectively of Morrisville, Vermont general contractor Donald P. Blake Jr, Inc. leads the team of contractors involved in the preservation, renovation, and addition to the historic building. 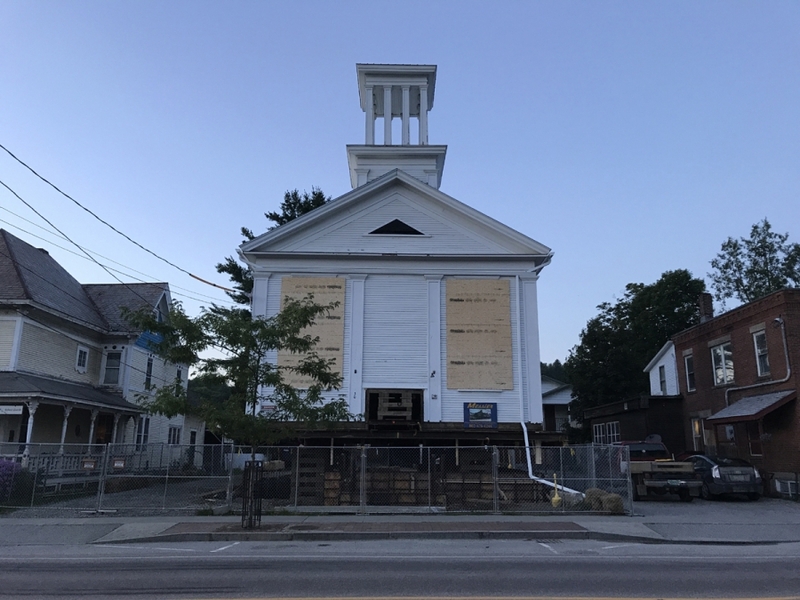 Key aspects of the building's detailing and construction will be preserved to celebrate its place in Johnson, Vermont's historic village. 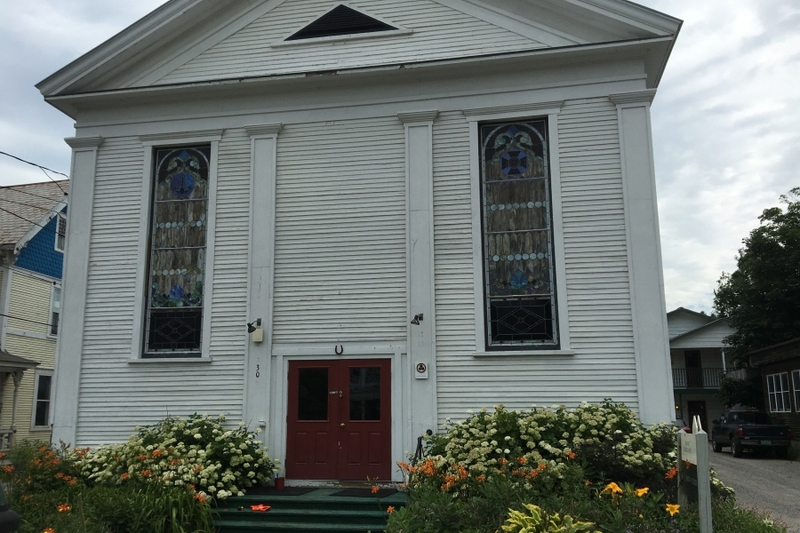 Building on the project's existing momentum, we are thrilled to share that on September 6, 2017 at the Vermont Governor's awards ceremony for the Agency of Commerce and Community Development's Downtown Tax Credit Program, VSC was awarded $100,000 in tax credits for the Church Studios project. In June 2016, a fire caused significant damage to the building, as well as destroyed the work and property of several artists. With tremendous community support and VSC's commitment to its campus, the Church Studios project became the project next in line for kickoff following the completion of the Kowalsky project. My head is consoled by watching VSC take another mindful and courageous step in her journey towards the preservation of intention, of history and of mission. The Church Studios Building at dusk from the South side of Main Street in Johnson, Vermont. For several weeks this summer building was raised to allow the construction of a new foundation and bearing walls for the original structure to rest on. Messier Construction and House Moving raised and lowered the building. Their process relies on incredible precision and care allowing even the most complex (and tall!) structures old or new to be raised in order to accommodate work beneath. Standing high above Main Street, the elevated Church Studios offered a dramatic perspective of the beautiful building immediately recognizable as a historic New England church. 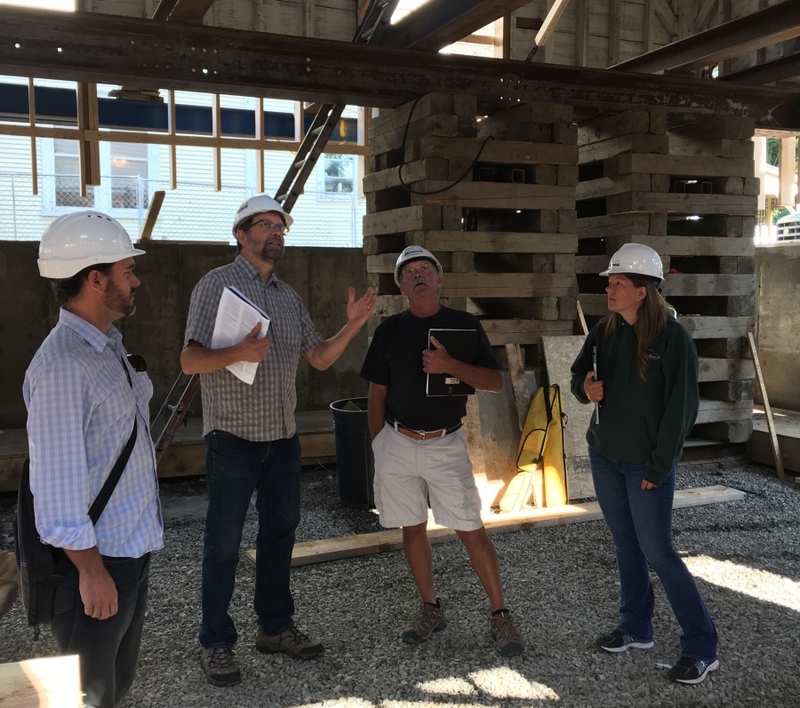 Left to Right: Mike Perpall, CDG Architect; Jeff Schoelkopf, Architect of Record; Tom Bjerke, Donald P. Blake Jr, Inc. Project Manager; and Roxanne Johnson of Donald P. Blake Jr, Inc.
Cribbing and and wide flange steel beams are used to temporarily support the raised building. The Church Studios resting on its new foundation on September 1st, 2017. The newly sheathed bearing walls at the building's base now wait for additional exterior work to commence. 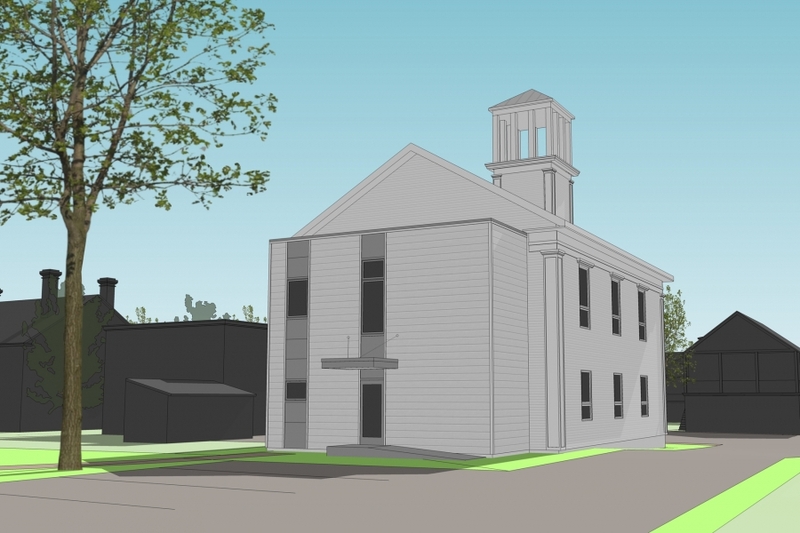 With the original structure now attached to its new foundation, renovations will continue on the original Church structure and an addition to the rear of the building with an accessible entry, lift, and accessible bathroom. The Church Studios will reopen in 2018 as Vermont Studio Center's first highly energy efficient, fully accessible studio building with 12 newly renovated studios, a wheelchair-accessible lift, and an advanced ventilation system.